In my recent post about Keynes’ “A Tract on Monetary Reform” I quoted Brad Delong for saying that Tract is the best monetarist book ever written. I also wrote that I disagreed with Brad on this. I actually think that one of the most important things about a monetarist (text)book should be a description of the monetary transmission mechanism. The description of the transmission mechanism is very good in Tract, but Yeager is even better on this point. 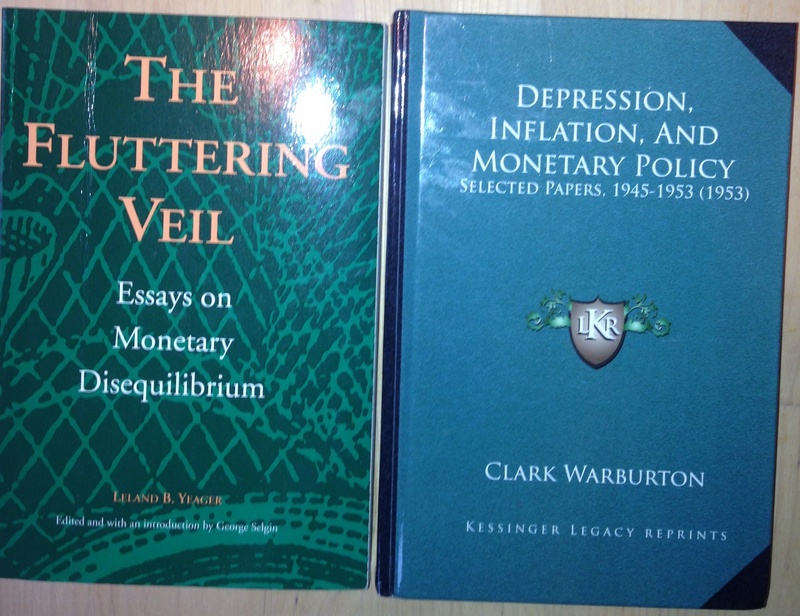 Finally I would also mention Clark Warburton’s “Depression, Inflation, and Monetary Policy; Selected Papers, 1945-1953″. Again a collection of articles, but it is very good and explains the monetary transmission mechanism very well. I believe Warburton was a much bigger inspiration for Friedman than he ever fully recognized – even though Warburton is mentioned in the introduction to “Monetary History”. So there you go. I recommend to anybody who wants to understand monetarist thinking to read Yeager and Warburton. Yeager and Warburton’s books mentioned above will particularly make you understand three topic. 1) The monetary transmission (and why interest rates is not at the core of it), 2) The crucial difference between money and credit and finally 3) Why both inflation and recessions are always and everywhere monetary phenomena. I will surely return to these books when I continue the reporting on my survey of monetary thinkers’ book recommendations in the coming days and weeks. PS Leland Yeager’s “Fluttering Veil” is a collection of articles edited by George Selgin. George deserves a lot of credit (if not money!) for putting it together. It is a massively impressive book, which unfortunately have been read by far too few economists and even fewer policy makers. I have to say, as a layman, I think a really good (modern) monetarist textbook would have to describe Japan’s experience 2001-6, when it went with QE (and had its longest postwar expansion) and then what happened when it stopped. Then of course, the miserable failings currently off the ECB, Fed and BoJ. These are some of the largest events in modern monetarism, and I think textbooks have to be re-written to bring these evens into focus. Also, although this gets into organizational theory, what is it about modern independent central banks that makes them so inflation-phobic? We can theorize all we want about the best monetary policy, but if central banks are ossified, cloistered, and obfuscatory, who cares what any textbook says? Another topic: What are the origins of the sacred 2 percent inflation ceiling? Is there any evidence that 2 percent is better than 2.5 percent, or 3 percent? I have to say, since so much is new on the monetarism scene, I think new textbooks are needed. Lastly, is the world drifting into ZLB and why? Secular trends in sovereign interest rates suggest so. Does the emergence of upper classes globally result in huge savings flows? Is there a monetarist response that makes sense if this is true (i think chronic QE). Michael Darby, Macroeconomics (McGraw-Hill, 1976) is a useful monetarist textbook.